Perhaps one of the more enlightening facts is the broad divide between credit card users who carry a monthly balance and those who tend to pay their balances in full each month. Those who carry balances are likely the ones who will use their credit cards for purchases such as groceries, utilities and other basics. This is usually due to a lack of other assets. Naturally, this would certainly lend to greater odds of these consumers defaulting on their credit card balances. Not only that, but for those who do find themselves with a balance each month after having made their credit card payments are also more likely to be unemployed more times than those who do appreciate a “paid in full” memo on their checks. For those who do pay their balances in full, they usually have been at the same job or in the same career the majority of their adult lives. These folks usually don’t struggle financially and are more likely to pay their mortgages off sooner. In other words, they’re typically upper or upper middle class families. Those with consistent balances on their credit cards have home equity of around $94,000 compared to those non-indebted consumers, who have on average, almost $167,000. The total assets of non-indebted consumers were approximately 11% higher than those indebted consumers. Further, those with no or little credit card debt will usually have twice as much money in their checking and savings accounts. Besides serving as important tool for the financial industry as a whole, there are changes being made to the credit card industry as a whole. These insights will serve, on some level, as guidance in how these new overhauls will fall into place. Further, it reveals how close many are to a financial crisis. With more Americans who already carry credit card balances struggling, many financial experts say many are living from one crisis to the next, hoping they can keep the proverbial balls in the air. Of course, many were unable to do so during recent economic downturns. It’s little wonder then so many Americans have found themselves filing bankruptcy or watching their credit scores take big hits. Starting over is never easy, but there are credit card offers available that will allow consumers to rebuilt their credit, and in the process, rebuild their assets. The Prepaid Visa RushCard is one of those credit cards. This Visa offers an opportunity to build one’s scores again with the RushPath to Credit program. Customers enjoy free text alerts on services such as balance checks and recent transactions. Direct deposit is also available and customers have access to customer service around the clock, 365 days a year. No interest rates, no annual fees and because it’s a prepaid credit card, there are no concerns over late payments. Another great choice that’s receiving a lot of buzz these days is the Insight MasterCard Prepaid Card. One reason it’s such a popular choice is the incentive – customers receive a $50 bonus with their first $200 direct deposit. Not only that, but this MasterCard offers flexibility. Card holders can opt for either a flat monthly fee or they can choose any of the pay as you go plans. It even offers optional overdraft protection. This is a strong card that’s well worth anyone’s consideration. Both of these cards offer 100% approval with free sign up. Less than perfect credit is no problem. 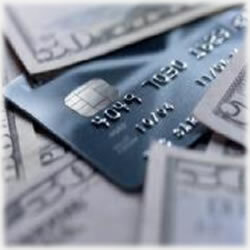 Prepaid credit cards have quickly become the best avenue for many Americans who found themselves in financial trouble in recent years. The study by Demos only solidifies what many of us have known for quite some time.